stir together flour, cornstarch and salt in a bowl. in a mixer fitted with the paddle attachment, cream butter and 1 cup powdered sugar until evenly mixed. beat in lemon zest and lemon juice. slowly stir in the flour mixture, mixing until just combined. gather the dough and form into a flat ball. divide dough into 4 pieces, rolling each into a log. the diameter of the log is to your own specifications, depending on your desired cookie size. my preference is about 2" round. wrap each log in plastic wrap and refrigerate for 2 hours or overnight. you may also freeze the log(s) at this time. when ready to bake, preheat the oven to 325. line cookie sheets with parchment. remove the log from plastic wrap and slice in 1/4" rounds. it is helpful to twist the log clockwise each time you cut, so as to avoid a flattened bottom. place cookies 1" apart on the cookie sheet and bake approximately 10-12 minutes. cookies are done when they are just turning golden on the bottom. while cookies are baking, place the remaining 1 cup powdered sugar in a shallow bowl. as you remove the cookies from the oven, they will be too delicate to handle. once they are cooled a bit (not fully cool, still slightly warm), carefully turn them in the powdered sugar, and place back onto same cookie sheet. the sugar will melt slightly and be a bit like frosting. 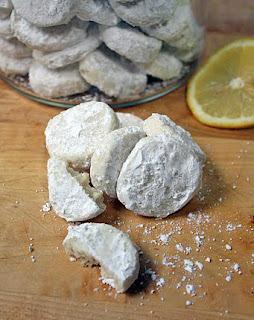 once the cookies are fully cooled, toss them in the powdered sugar a second time.